The Qin Terra Cotta Warriors site near Xi'an city has nearly 8,000 life-sized pottery warriors and horses in battle attire and formation. They had been buried for over 2,200 years. This terra cotta statuary is considered to be the most important archaeological discovery of the 20th century. The pottery warriors and horses (along with wooden chariots) were buried to protect the 3rd century BC Emperor Qin in his afterlife. He is historically important because he was the first ruler to unite China. The site was discovered accidentally in 1974 when several local peasants were digging a well and came across some pottery relics. Archaeologists quickly determined their ancient origin and began excavating the site. This is the main and largest. 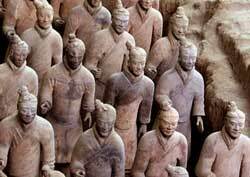 It houses 6,000 life-sized terra cotta warriors (see photo). Originally, they were colorfully painted. The underground combat-ready soldiers are accompanied by sculpted horses, chariots and more.